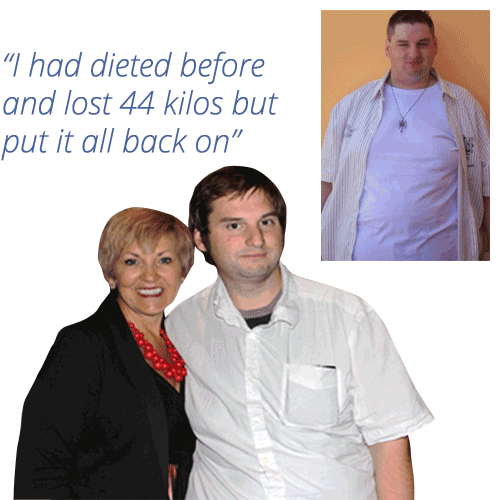 I love to hear the success stories from people who have used my cookbooks to transform their lives. Attending Annette’s 3 Day Workshop Retreat in 2012 turned my life around. I had been trying to lose weight since 2007 and my weight was always up and down. I had never stuck with anything until I met Annette and for some reason the things she said at the retreat just made sense. I managed to lose 18 kilos and reach my goal weight of 58kg. 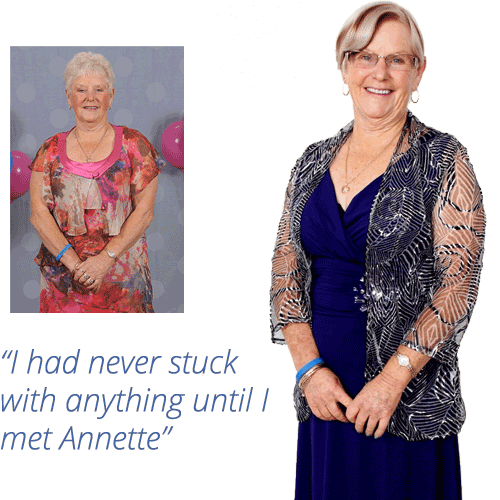 I can’t stop telling people about the wonderful things Annette has helped me achieve. The day I realised I weighed a very unhealthy 158kg was a real low point for me. I was so embarrassed, I felt disgusted & ashamed of myself. It took me eight months but thanks to the Symply Too Good To Be True cookbooks and sheer determination, I achieved my goal weight shedding 64kg in total and now weigh 94kg. Pictured here with Annette Oct 2013 at 106kg. 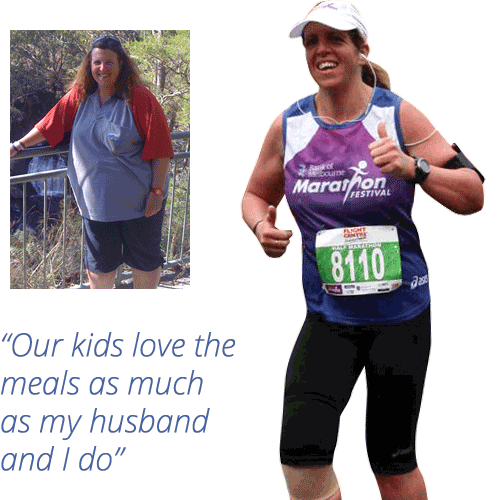 The turning point was the family photo you see above – I looked at it and literally said “have a look at me, that is disgusting!” After having 4 babies in 4 years I hit the scales at 108kg! With help from Annette’s fantastic recipes, exercise and changing my eating habits I was able to lose 39 kilos and maintain it. I now weigh 69kg. From a size 18 to a size 10 in 2 years, cholesterol down from 8.9 to 4.1 and a more confident, happier and healthier person. Crunch time came at my son’s 21st birthday in January 2013. I felt fat, my clothes were tight and I noticed people looking at my stomach. The next day I decided enough was enough. 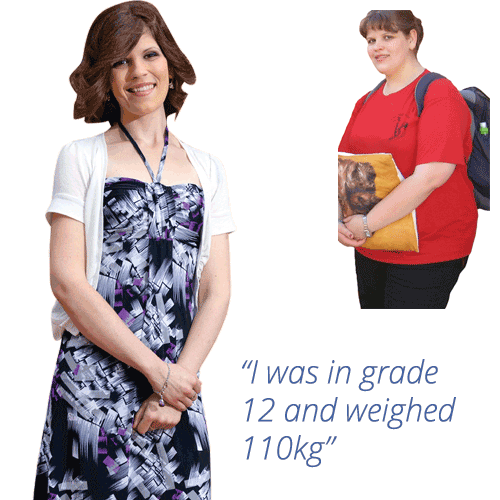 I stood on the scales for the first time in years, I weighed 123 kilos. It was time to change! I lost 39 kilos in twelve months and now weigh 84 kilos. I couldn’t have done it without Annette’s cookbooks. Hi Annette. You visited my son’s school today at Moreton Bay Boys College and he was so impressed with your hamburgers and gluten free Symple Brownies. For a boy who will never try anything that is healthy I must thank you. He wants me to get the book and even wants to make the hamburgers himself. Could you please let me know which edition of your books has these lovely recipes. Much appreciated. I have used book 5 with excellent results I have lost 12 kgs with another 5 to go and have found these to be a great guide, the menu plan can even be interchanged with other recipes from this great set of recipe books….as long as you stick with the calories for that day you will have success. 2 kg down & 11 cm lost since starting using your cookbooks 3 weeks ago!!! I just wanted to Thank you for the fantastic books that you have created. 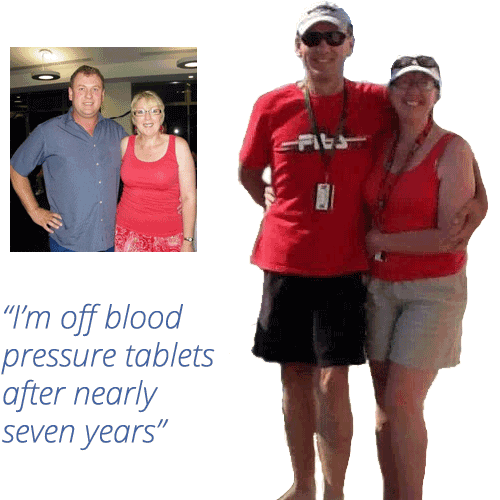 My mother and I have used them to lose a combined weight of 22kg in 11 weeks. Your recipes have made this easy. You are an inspiration and I hope that you continue to create these great recipes. I just wanted to let you know how much I love your cookbooks! I have successfully lost the 15 kg gained during my first pregnancy. I was really hoping not to gain weight again with my second pregnancy but somehow gained the same amount second time around. During my first pregnancy I gained a lot of weight, had severe fluid retention and was induced at 40 weeks due to gestational diabetes. Throughout my second pregnancy I used your recipes and can happily report no gestational diabetes, fluid retention only in the final week and the pregnancy went full term. I have you to thank for giving me hope and confidence that I can lose the weight, and more, again! I have so far lost 10kg and will be continuing until I reach my goal. I love that I can eat normal food and that I can have complete faith that if I work hard and stick to the plan the weight will go! I really cannot thank you enough as you have changed my life. For the last 2 weeks I have been cooking out of book 5 and following the 28 day menu plan. I am pleased to tell you I have lost 4 kg, so very thrilled and so very happy, feel so much better and hubby liking it also. Turning 50 made me evaluate everything. I had to work out what was making me unhappy and it was my weight. I worked on my mindset first and once I got that somewhat in the right place I was ready to start losing my weight. I lost 9.5kg in 6 months and feel lighter, healthier, fitter and stronger. It’s been 12 weeks since I attended Annette’s 2014 3 Day Retreat in Caloundra and I am happy to report I have shed 10.4 kilos. I love knowing I have the support from the lovely people in our closed Facebook group on the days when I need encouragement. Thank you Annette for changing my life and for all the support you continue to give us. I just bought a Yonanas, and have been having banana and strawberry frozen desserts, YUM! Thank you for this ice cream maker, I’ve got to keep reminding myself that it’s actually healthy! My husband and I have each lost 7.5 kilos in 10 weeks using your cookbooks. My husband is vegetarian and is enjoying the vegetarian variations provided.